America's most dependable provocateur returns with an inflamed documentary that’s a lot more substantial than its anti-Trump title would suggest. ‘Was it all just a dream?’ Michael Moore wonders at the start of ‘Fahrenheit 11/9’, his Trump-era update of his 2004 state of the union. Thankfully, he gets a lot more unsentimental from there. Even though that question comes under footage of Hillary Clinton swanning around at pre-election rallies to Rachel Platten’s ‘Fight Song’, don’t confuse the director’s latest for a two-hour wound-licking. By the time we hit the documentary’s final seconds – when Moore cuts to an emergency-broadcast squeal and we see Hawaiians running for cover in a near-apocalyptic 2018 missile mistake – the dream has morphed into a nightmare, expanding into more than just a loss by one overconfident candidate or party, but democracy itself. 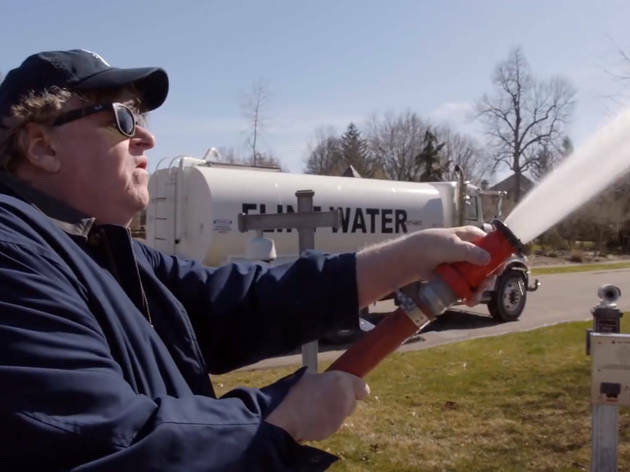 Like much of Moore’s work, ‘Fahrenheit 11/9’ (so titled for the date in 2016 when the Associated Press called the election for Trump) feels like an overflowing rage volcano, not that such an approach is unmerited. There are tangents galore, including early cheap shots about the president’s handsy relationship with his daughter, Ivanka, and a montage of gropes; meanwhile, if you’re heading into the film for a making-of-a-monster exposé, you’ll feel shortchanged. It’s not about New York City real-estate history or Russian collusion, and Moore even includes moments from a 1998 TV talk show on which he appeared with Trump and played nice. ‘I hope he never does one with me,’ Trump jokes of Moore’s movies, almost charmingly. But what makes Moore’s latest so ferocious – and pound for pound his most effective piece of journalism – is the way it pivots to a meaty central subject that isn’t Trump but has prescient echoes. We’re back in Moore’s beloved Flint, Michigan, where, in 2012, the corporate-friendly governor institutes ‘emergency management’ and short-circuits public oversight in order to boost the prospects of a lucrative alternate water pipeline. The kids get irreversibly sick from lead poisoning. Elsewhere and more hopefully, poor West Virginian teachers go on strike (‘Fahrenheit 11/9’s most shocking factoid is the lefty origin of the term redneck, related to pro-union bandanas). They rail against pay cuts and an Orwellian mandate that links their health-care coverage to mandatory Fitbit usage. Powerfully, these two strands develop a climate: a pre-Trump encroachment on authority (under the guise of ‘better business’) as well as the fighting spirit of solidary – young as the Parkland kids – that’s much less diminished than pundits would have you believe. Moore is laying out the conditions that give rise to know-nothing autocrats. By the time he gets around to ‘Fahrenheit 11/9’s most devastating sequence – a comparison with Trump to Hitler, also a punisher of athletes and an exploiter of division – it’s fully earned by the context of the previous hour. Moore is an equal opportunity offender: Your audience will squirm at his inclusion of Barack Obama minimising the concerns of Flint by drinking its water in a public stunt that was beneath him. But sometimes it’s healthy to rip off the Band-Aid. Overall, the movie is saying: Don’t put your faith in heroes. Get out there, organise, fix it yourself. The shocking truth about politics today given an up-to-date airing by this incisive film-maker. You can hear the sadness in his voiceovers at the corrupt state of politics in his beloved home country. It's not only Trump's love of money and women that feature here. It's a story about greed and self glorification of politicians spread throughout America, how it happened and beware of worse. Some bright spots at the end, thank goodness. There are pockets of American society who have had enough and are fighting back. Their message is gathering strength. We need to take stock.